Pecos Valley REC 8 now offers online driver's education for schools that need a way to provide students with a driver's education class. The online course is Quality Matters certified and allows students to learn at his or her own pace. Schools can enroll students at any time as long as students are at least 15-years-old. For more information regarding Driver's Ed New Mexico, please contact Naira Stearnes via email or by calling (575) 748.6100. Recently, Lake Arthur graduate and former SystemsGo New Mexico student, Jazmin Pando; Lake Arthur’s SystemsGo New Mexico teacher, Steven Goluska; and members of the Pecos Valley REC 8 traveled to Taos, New Mexico, to present the art of rocket science to the group of teenagers attending the 2018 Independent Living Youth Conference. Please take a moment to read more about this conference experience using the link below. When was the last time you attended a class where the students, teachers, and administrators were this interested at 7:30 at night? Our Aerospace Engineering II students, along with students from Lake Arthur and Loving, presented their flight profile for a rocket that they are designing that will go the speed of sound. The students created the flight profile entirely in Excel and presented the profile to a panel of engineers. The panel included David Roybal, civil engineer from Pettigrew; Marc Lumeyer, electrical engineer from Virgin Galactic; and led by Chris Madsen, aerospace engineer from NASA. 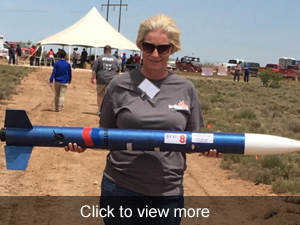 The SystemsGo New Mexico inaugural rocket launch was a huge success. Nearly 600 spectators came out to the Jal launch site to take part in the program’s first launch and to support the students that engineered the rockets. Ten rockets checked in and nine cleared safety regulations at stage two. All nine rockets made it down to the Discovery Education launch pad, and all nine rockets took flight. Jal’s high school team was the first to launch their rocket. The excitement from the kids and the crowd was unexplainable. Together teachers, students, principals, and superintendents shared in the enjoyment and success of seeing their school’s rocket fly high into the air. Next year’s launch date is set to be on April 21, 2018. If you are interested in bringing this program to your school please contact Dave Willden at (575) 748.6100. Improve education in America by inspiring students, teachers, and administrators within the present educational system. Motivate and equip high school students to develop 21st century skills and pursue careers in science, technology, engineering, and mathematics. On October 6, 2016, at the Holloman Air Force Base, SystemsGo New Mexico participated in the 2016 Aerospace Career Fair Expo put on by the New Mexico Aviation Aerospace Association. The career fair hosted middle school and high school students from the Las Cruces, Alamogordo, Ruidoso, and Cloudcroft areas. 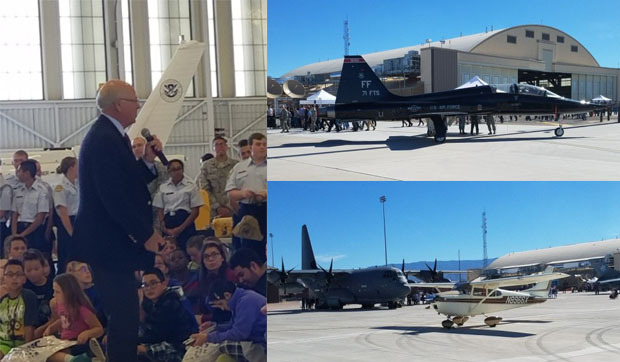 Congressman Steve Pearce spoke at the beginning of the career fair encouraging students to go into the professions of aviation and aerospace.